No more white boards and markers, no more digging through personnel files, no more spreadsheets tracking certifications, no more guessing period! 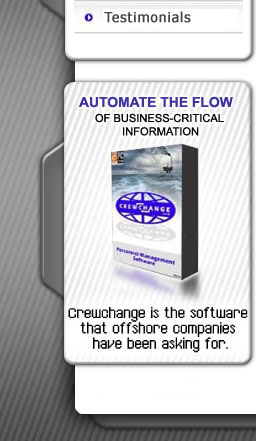 CrewChange™ is THE offshore personnel management software that offshore companies have been seaching for! CrewChange™ completely handles customers, jobs, crew changes, safety certifications, human resources and a document imaging system all in one package! CrewChange™ creates intelligent management flow at any and all levels fast and efficiently!